California Institute of Technology, Pasadena 91125-2500, U.S.A.
Panguite (IMA 2010-057), (Ti4+,Sc,Al,Mg,Zr,Ca)1.8O3, is a new titania, occurring as fine-grained crystals with Ti-rich davisite in an ultra-refractory inclusion within an amoeboid olivine inclusion from the Allende CV3 carbonaceous chondrite. The phase was characterized by SEM, EBSD, synchrotron micro-diffraction, micro-Raman and EPMA. The mean chemical composition of the type panguite is (wt%) TiO2 47.97, ZrO2 14.61, Sc2O3 10.67, Al2O3 7.58, MgO 5.54, Y2O3 5.38, CaO 3.34, SiO2 1.89, FeO 1.81, V2O3 0.95, Cr2O3 0.54, HfO2 0.28, sum 100.55 with a corresponding empirical formula calculated on the basis of 3 O atoms of [(Ti0.79Zr0.16Si0.04)4+Σ0.99(Sc0.20Al0.20Y0.07V0.02Cr0.01)3+Σ0.50(Mg0.18Ca0.08Fe0.03)2+Σ0.29]Σ1.78O3. Synchrotron micro-Laue diffraction (i.e., an energy scan by a high flux X-ray monochromatic beam and white beam diffraction) on one type domain at sub-micrometer resolution revealed that panguite is an orthorhombic mineral in space group Pbca. The structure is a subgroup of the Ia3 bixbyite-type. The cell parameters are a = 9.781(1) Å, b = 9.778(2) Å, and c = 9.815(1) Å, yielding V = 938.7(1) Å3, Z = 16 and a calculated density of 3.746 g/cm3. 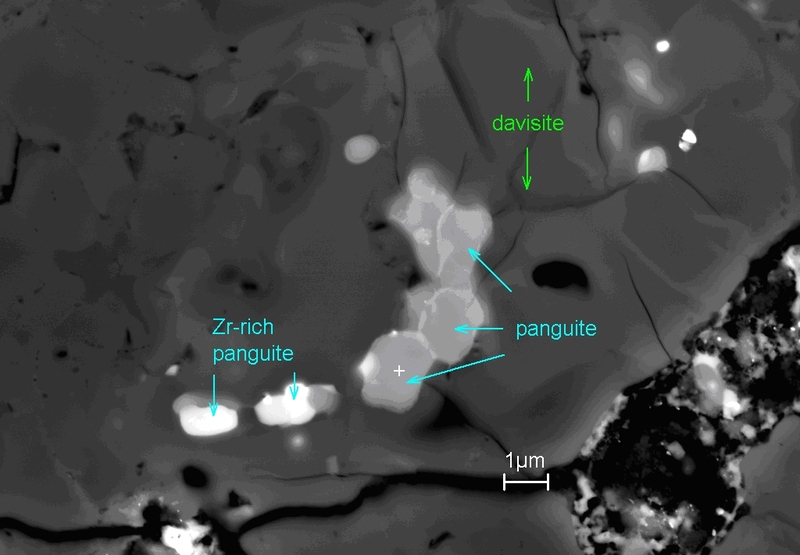 Panguite is not only a new titania mineral, but also a new material, likely formed by condensation. It is one of the oldest minerals in the solar system.